When I was attempting to clean up after my son yesterday, I noticed that every room in my home has some form of word or graphic art. I am not sure how this came to be, I didn’t have any intention of showcasing words in my home, but I have. I like word art, it personalizes your home decor and you can showcase words and phrases that are special to you and your family. Word art has been a trend for several years. I am thinking it is one of those things that will continue to be popular, I am crossing my fingers, because I can’t afford to redecorate my entire home! 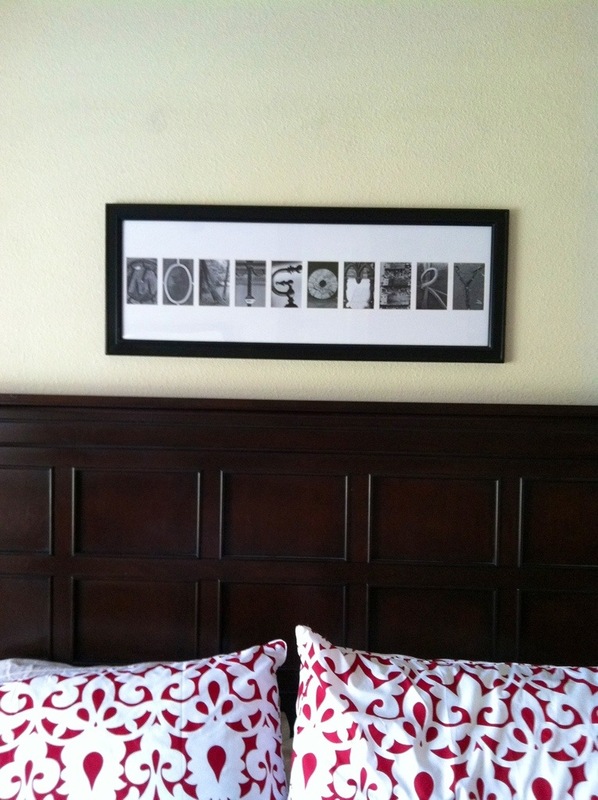 I love this print that spells out our last name in different photos of letters. 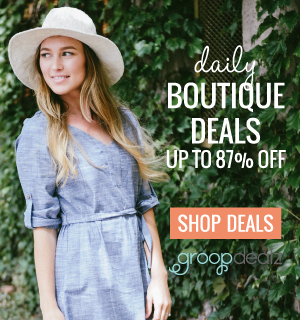 I have seen Pinterest projects that claim you can do this for dollars, click here. I am not much of a crafter, so I bought this from Frame the Alphabet through a Groupon deal for $49. If you were to buy a frame that was 39.5 x 15.5, print the photos, and get a custom mat the price would be about the same and you wouldn’t have to do any work! Right now, if you like Frame the Alphabet’s facebook page you can get $75 off an order like my framed name with the promo code FBMOTHER. These make great gifts, I gave one to my BFF and her now husband for an engagement gift. I am thinking of getting one for my son’s room. I gave this to my husband on our first wedding anniversary, we had no money for extravagant trips or gifts. I typed up our wedding vows, found one of the graphics used in our wedding program used it as a watermark, printed it on “fancy” paper, and put it in a Target frame for $15. He absolutely loved this gift! 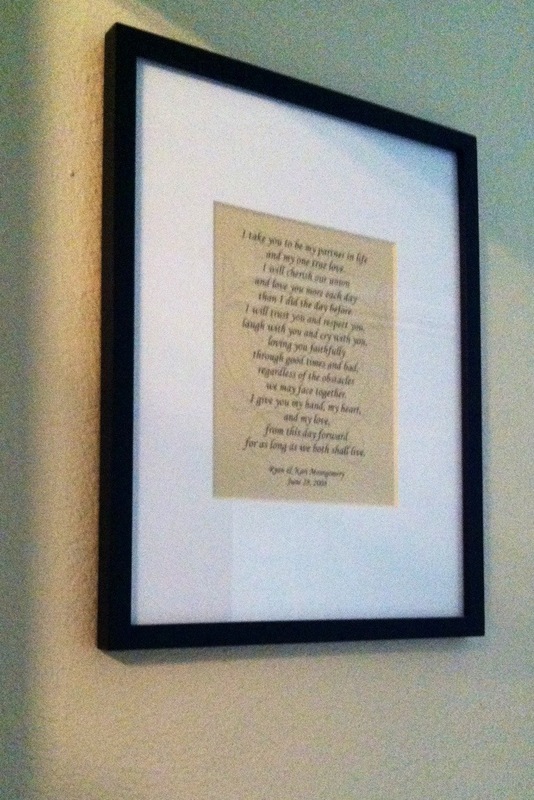 I love that our vows are in our room and we walk past them every time we enter and leave our bedroom. 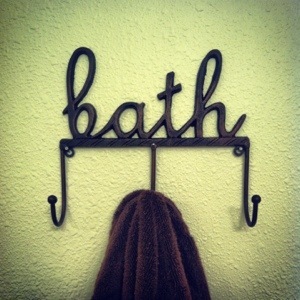 I have this cute bath hook, well obviously in my bathroom. I like that it is metal and has a copper-wrought iron look. 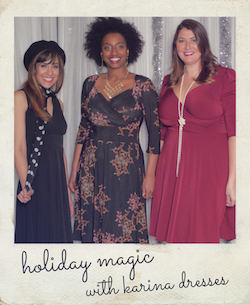 I bought it a few months ago at Ross, the details of that shopping trip are here. 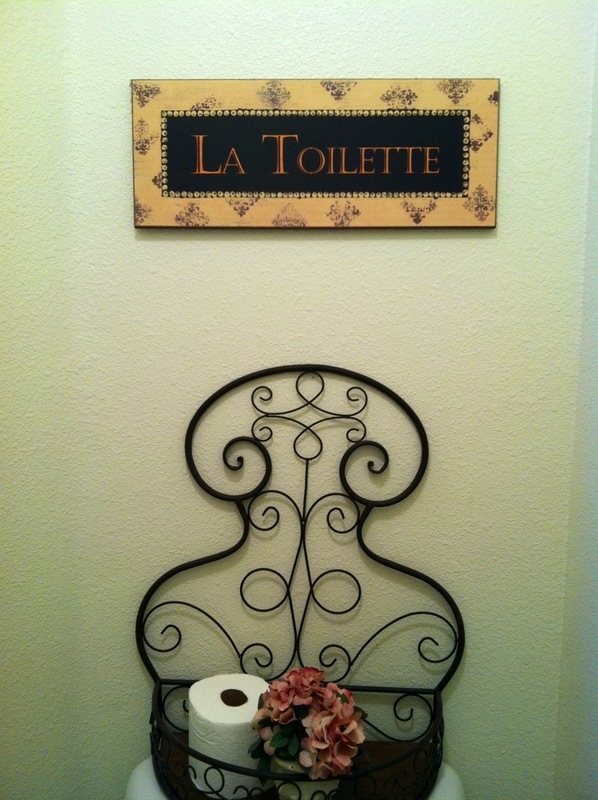 Another, obvious sign “la toilette” above the commode. I honestly don’t know where I got this, I would guess the usual suspects – Ross, Target, Homegoods, or TJ Maxx. My master bathroom has a tiny toilet closet and I have struggled with how to decorate the space. For now this will have to do. In the next week I will post word art from other parts of my home. Hope this gave you some decorating ideas. What do you think of word art? Let me know. It is when people personalize nooks and crannies of their house, it becomes a ‘home’. Inspiring ideas! Keep them coming. Word Art: Master bed and Bath: I have printed poems and hung them in our bedroom. I hope to frame them now like your frame with the wedding vows. PS: I should have posted this with my earlier comment. Feel free to combine my thoughts. Thanks! You should frame them! Post pics! I would love to see how they turn out! Thank you! I totally agree, small personal touches turn a house into a home! I’ve never seen such a flattering toilet roll. ;) That’s really inspiring! I love the wedding vow idea! I would love to do something like that for our first anniversary. I especially like the idea of hanging it in the bedroom so that you pass it every morning and night. You should totally do it with one of your wedding pics. I saw where someone printed their vows over a sunset wedding pic and it looked great! I actually did something similar to that for a client. She had me print their first dance song lyrics faded over their wedding portrait. That’s such a neat idea! Ooh! You have to do it and post pics!